Note : Avoid visiting from around 22nd to 30th January as it's closed mostly because of VIP entry during those days. 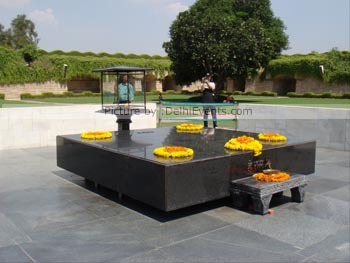 About Rajghat : Mahatma Gandhi also known as 'Bapu' was shot dead on 30th January, 1948 by a fanatic Nathu Ram Godse. His body was cremated on the western bank of Yamuna river next day and the ashes were thrown in the seas and other principal Indian rivers. It was decided to honour him by creating a monument in the cremation ground. Other samadhis in the vicinity are of Lal Bahadur Shastri, Indira Gandhi, Choudhary Charan Singh, Rajiv Gandhi, Giani Zail Singh. National Gandhi Museum : You can also visit the Gandhi Museum at Rajghat which displays many belongings of Mahatma Gandhi.